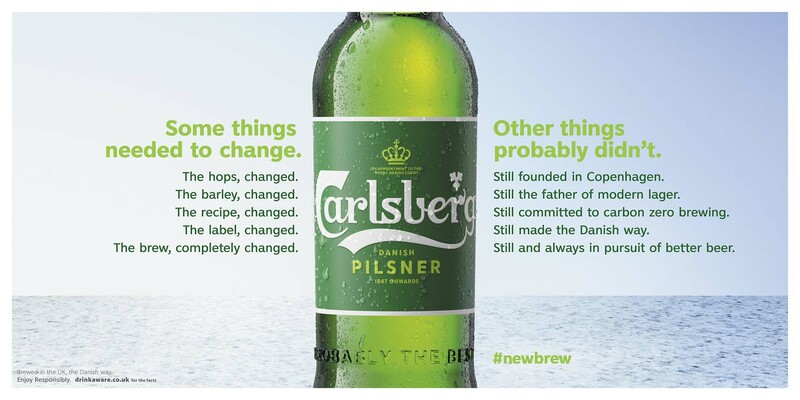 Carlsberg has taken the bold decision to acknowledge that its standard lager was not previously up to scratch in the first campaign for its recently rebranded Carlsberg Danish Pilsner. The 3.8% ABV lager, previously just called Carlsberg, was relaunched last month with a new recipe and fresh design scheme. It followed the relaunch of Carlsberg Export in 2017 with brand cues designed to grow awareness of its Danish heritage. Created by Fold7, the £20m campaign kicks off today with out-of-home, social and digital executions that outline the changes that have been made to the product and candidly reflect on why the previous version was not always highly regarded: "We focused on brewing quantity, not quality. We became one of the cheapest, not the best." The creative director on the campaign is Adrian Lim. The media agency is Initiative. Activity will be followed in May by a TV ad that will once again see the return of Mads Mikkelsen’s Danish "philosopher" character, who was introduced by Fold7 in the UK and has since appeared internationally. Carlsberg said the campaign came with the number of people drinking "standard" lager – such as Carlsberg, Carling and Foster’s – having fallen by 1.6 million in the past five years, according to Kantar Alcovision. Liam Newton, vice-president marketing at Carlsberg UK, said: "Drinker's interest in mainstream lager has waned because, though the world has moved on, the mainstream category hasn't. 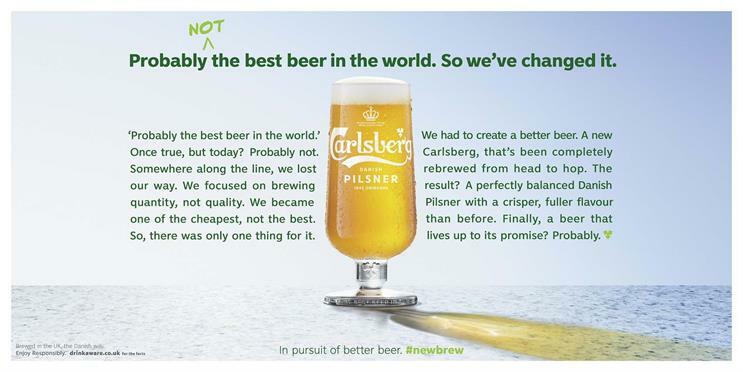 "At Carlsberg UK, we lost our way. In order to live up to our promise of being ‘probably the best beer in the world’, we had to start again. We’ve completely rebrewed Carlsberg from head to hop." The lower-alcohol Carlsberg was created for the UK market, where beer drinkers were traditionally not used to stronger European brews. The product sold as Carlsberg in most countries, including its native Denmark, is a traditional 5% ABV pilsner, similar to the UK’s Carlsberg Export. As British consumers have become more used to brands such as Stella Artois, Kronenbourg 1664 and Peroni – which are a similar strength in the UK and their home countries – Carlsberg gained a perception among many drinkers as weak and bland. This reputation has also affected the more "authentic" Carlsberg Export, which performs well against competitors in blind taste tests, but less so when the brands are identified.